Human CX3CL1, His Tag (CX1-H5221) is expressed from human 293 cells (HEK293). It contains AA Gln 25 - Gln 341 (Accession # AAH01163). The protein has a calculated MW of 35.5 kDa. 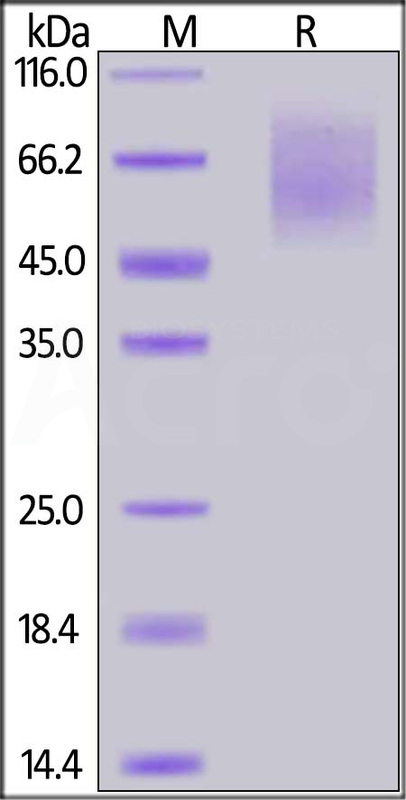 The protein migrates as 50-90 kDa under reducing (R) condition (SDS-PAGE) due to glycosylation. Human CX3CL1, His Tag on SDS-PAGE under reducing (R) condition. The gel was stained overnight with Coomassie Blue. The purity of the protein is greater than 95%. Fractalkine is also known as C-X3-C motif chemokine 1 (CX3CL1) and neurotactin. Fractalkine is a large cytokine protein of 373 amino acids, it contains multiple domains and is the only known member of the CX3C chemokine family. Fractalkine is found commonly throughout the brain, particularly in neural cells, and its receptor is known to be present on microglial cells. It has also been found to be essential for microglial cell migration. CX3CL1 is also up-regulated in the hippocampus during a brief temporal window following spatial learning, the purpose of which may be to regulate glutamate-mediated neurotransmission tone. This indicates a possible role for the chemokine in the protective plasticity process of synaptic scaling. (1) Bazan J.F., et al., 1997, Nature 385:640-644. (2) Hoover D.M., et al., 2000, J. Biol. Chem. 275:23187-23193.